My grandparents used to own a cemetery in Louisiana. I was six and my sister was three when late one Thanksgiving afternoon, after we had all eaten, my oldest cousin snuck away to set up a prank on all of us younger cousins, 6 of us to be exact with the 4 oldest being boys (Seven with the oldest prankster). 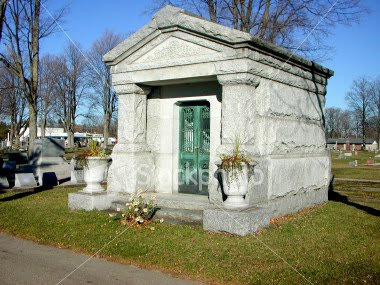 He then came inside, got us and took us up to the only above ground mausoleum in the cemetery, telling us we just "HAD" to come and see. Once we got close, he told us the ghosts were trying to get out and were coming to get us and kill us! He had wedged a turkey thigh bone into the crack around the perimeter of the door and poured ketchup all over it to make it look like blood! When we got really close to look, he shoved us towards the door and screamed, "THEY'RE GETTING OUT" and ran down the hill and left us all there! We were screaming and crying and trying to run away, bumping into each other and grabbing onto each other while still trying to escape (envision The Keystone Kops). 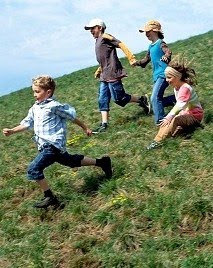 All of my cousins older than myself and my sister were able to run but we, being the youngest, were so terrified and crying, we couldn't see and we stumbled around, running and falling until we made it down the hill and back home. My sister and I were traumatized about that for years to come! Needless to say, our "old prankster" got the stick and we got the laugh! We sought revenge later in the weekend by luring him into the basement and later into the cemetery barn and scaring the bejeezus outta him both times by making ghost sounds and bumping around! Revenge is a dish best served COLD! At any rate, my grandmother made the best cornbread dressing and it has been our family tradition to have it with Giblet gravy since long before I was born. She passed her recipes on to me and I took over some of the holiday cooking duties in my mid 20’s. Later I introduced Spinach Madeline (see recipe in another post) and that has now become our other traditional favorite dish along with Sweet Potato Casserole. Beat the eggs in a medium bowl until frothy. Add the corn meal, salt, baking soda and baking powder, and stir to combine. Add the buttermilk and stir well. Remove the hot dish from the oven. Swirl the dish to coat it with melted bacon drippings/butter then pour it into the batter and stir to combine. Pour the batter into the pan, and bake 20 to 25 minutes. The cornbread will begin to pull away from the sides of the pan. Make the cornbread a day before you intend to make your dressing. Leave it out, uncovered, overnight. Bake 15 minutes then stir dressing from the sides of the pan into the rest so that it cooks uniformly. Recheck the seasonings, adding more if necessary. Bake until browning on sides and top and center has set. It's not a holiday without spinach Madeleine! This is like crack for me and I've been known to eat it as a dip with tortilla chips. Where are you finding Mexican velveeta? I still have to go the jalapeno route. Thanks for posting all of these great holiday recipes! LOL, You're right, it's not a holiday without Spinach Madeline and it is like Crack...addictive! Mexican velveeta is located with all the other Velveeta cheeses (in boxes). It looks the same as the others but has "Mexican" on the logo. I'll post something on the Tips and Information page. I am no longer certain whether or not this post is written by way of him as no one else understand such distinct about my difficulty. It's a very sad thing that a sorry low class piece of trash would print something like that! clearness on your put up is just spectacular and that i can suppose you're an expert in this subject. Well together with your permission allow me to clutch your RSS feed to stay updated with forthcoming post. Thank you one million and please keep up the enjoyable work. pendant, rings, bracelet, trinket & hair add-ons. It's going to be end of mine day, but before end I am reading this wonderful article to improve my knowledge. Hi there everybody, here every person is sharing these familiarity, therefore it's pleasant to read this blog, and I used to pay a quick visit this weblog everyday. it's truly informative. I'm gonna watch out for brussels. I'll appreciate if you continue this in future. Numerous people will be benefited from your writing. Cheers! i came to “return the favor”.I'm attempting to find things to improve my web site!I suppose its ok to use some of your ideas!! Link exchange is nothing else however it is simply placing the other person's weblog link on your page at proper place and other person will also do similar in support of you. I just could not depart your website before suggesting that I really enjoyed the standard info a person supply for your visitors? the internet. I am going to highly recommend this website! therefore it's pleasant to read this website, and I used to pay a visit this web site every day. the internet to get automatic signups in your business online. fatalities and approximately 500 wounded. This article has really peaked my interest. I'm going to bookmark your website and keep checking for new details about once per week. I opted in for your Feed as well. Un blog excepcionalmente agradable, y un diseño fino que hay chispas Simplicidad y complejo algoritmo de la red. Gracias. Has your SITE been hacked ??? The links on here are awful. LOL the person worried about your spelling - should be worried about their behavior vs spelling. I'm not prude but - corn bread dressing and ah what that girl was "eating" not on the same menu!!! I'm sure your site offers some great info - but PLEASE clean these remarks up!! Do you know if the white/whole wheat bread can be substituted for a gluten free bread? I have been diagnosed with Celiac Disease and can't digest anything containing wheat/rye/barley? This is my first Thanksgiving having to go GF. Hello. My grandmother is a Celiac. An white gluten free bread works great for making her dressing. You can also look for gluten cornbread mix. So, is it ok to substitute self rising cornmeal ? I have never been to your site before. I found you while looking for a good recipe for cornbread dressing for Thanksgiving. I am going to try yours as it looks good to me. I read the comments simply looking for comments about the recipe and only saw ONE. Why are people making all these remarks and criticisms of your page? Seriously I would love to see what people think of the cornbread recipe! 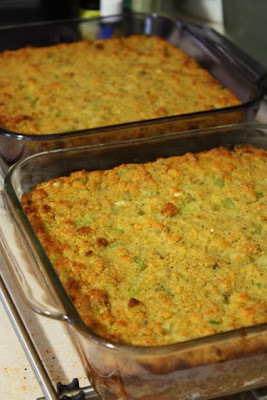 Love your recipes and especially the stories that go along with them...your cornbread dressing is very similar to mine...and it came from a Grandmother who was born in Alabama and raised a family in Texas. I was doing some comparisons on the internet for fun. Glad I stumbled on your site.